As movie stars arrive at the foot of the Cannes Film Festival red carpeted Stairs for a short stroll through the photographer’s flashes, a crowd of ordinary people gathers hoping to catch a glance at someone famous. Alas, the red carpet is hidden behind rows of accredited photographers. The only visible Stars are on the giant screen overlooking the Stairs. Hundreds of cell phones and compact cameras are pointed to it awaiting the appearance of that favorite comedian. On the sidewalk opposite the Stairs is a special group of dedicated fans. They arrive three days before the launch of the festival to secure their seats and step ladders in front of the red carpet, a prime spot to photograph the stars as they arrive. Most of them are assiduous amateurs who return every year to enrich their photo collection. This is a made-for-TV giant photocall, not a news event. Photographers and cameramen are required to sport a black tuxedo and assigned a numbered position according to their importance. The intended high-class of the show is ruined by loud low grade pop music and cheesy speaker commentaries. All is bright and beautiful in front of the camera, it’s the magic of cinema. As with all magic the tricks are only visible behind the scene. Press photographers and editors do their post-production work in offices in the Palais des Festivals basement, beneath the red carpet. No large comfortable press room here. Press agencies spend a fortune to rent high-speed internet access and a windowless wooden prefab office, as small as 9m2. The picture editors spend 12-15 hours daily in this space for the festival’s duration. Some people are in Cannes during the festival to actually try to see selected movies. Anonymous cinephiles stand at the entrance of the Palais des Festivals brandishing placards asking professionals coming in and out for spare invitations for the next film presentation. They are dressed-up to be allowed in should they be lucky enough to get one. The complete “Cannes Film Festival Star Gazing Challenge” photo series can be viewed here on my PhotoShelter archive. It has begun! Pro photographers shoot features, amateur photographers guard their step ladders -chained to fences in front of the venue three days earlier- and the city’s energy level rises prior to the evening’s opening ceremony. When it finally gets under way, a crowd is there to attempt to catch a glimpse and grab a frame of the movie stars climbing the famous red carpeted steps. Click on the photo to view the gallery. This year again I am commissioned by ARTE, the franco-german TV channel, to cover their activities during the festival. This means ten days of lunches, cocktails and lounge parties on the yacht rented for the event to greet actors, directors and producers of the 15 films produced by ARTE and presented in the festival. 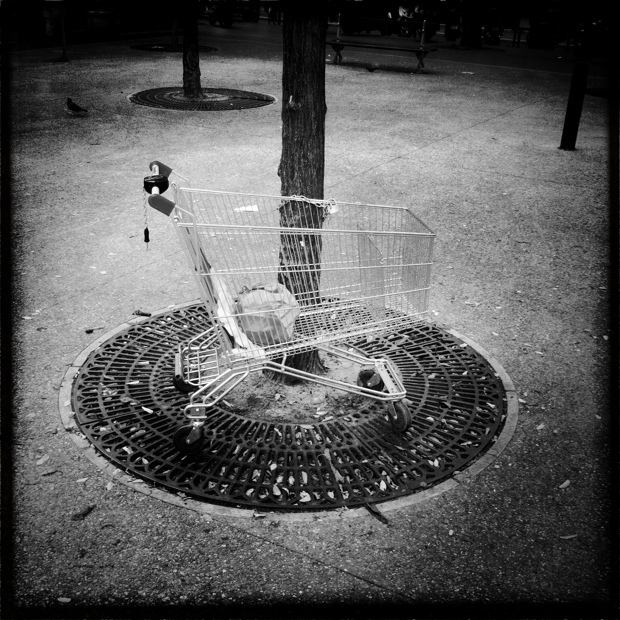 A homeless’ shopping cart chained to a tree, Place de l’Île de la Réunion in Paris.